Moong dal and split urad dal are soaked for couple of hours and cooked with rice. The cooked rice is then seasoned with whole spices and powdered spices. Potato and onion are also added to the kichdi. Serve urad and moong dal kichdi with dollop of ghee. Makes: around 4 Servings of Moong Urad Kichdi. Boil potatoes in water till soft. Grind cloves and cinnamon into fine powder. Soak urad dal in water for around half an hour. Rub the soaked urad dal between fingers to loosen the skin. Strain the urad dal to discard some of the skins. Soak moong dal in water for half an hour. Bring to boil 5 cups of water to boil. Stir in soaked dals and rice. Boil till rice and both the dals are cooked. Heat oil in a pan, add cumin seeds. Fry till they change color, add chopped onion. Once onion turns light brown, add chopped potatoes. Fry briefly, stir in ground clove and cinnamon powder, coriander powder, black pepper powder and salt. Fry for couple of seconds and add to the rice pot. Stir well and cook the rice for 5 – 10 more minutes to let the rice absorb all the flavors. 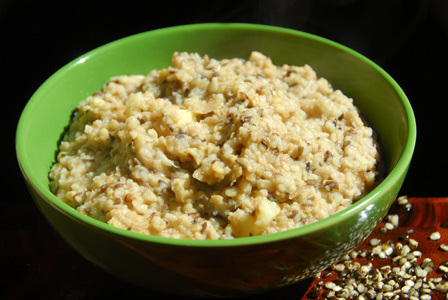 Remove from heat and serve urad and moong dal kichdi with dollop of ghee. Notes: Make sure dals are cooked well. Suggestions: If moong dal or urad dal are not cooked well, add more water to teh pot and cook on low flame till done. Variations: Check other recipes with rice here. Other Names: Moong Urad Kichdi. Chana dal, urad dal and moong dal is soaked in water and ground into paste with spices. The batter is then scooped and dropped into hot oil and fried till golden brown in color. 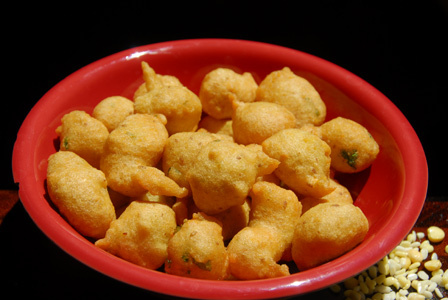 Serve dal fritters as a snack. Makes: around 6 Servings of Dal Fritters. Soak chana dal, urad dal and moong dal in water for 3 – 4 hours or until the dals are well soaked. Strain the dals and keep aside. Grind soaked dals, green chiles, cumin seeds and salt into smooth paste adding little water. Remove the ground dals mixture into a bowl and stir in cilantro. When oil gets hot, carefully drop a small scoop of the dals mixture into the oil. Repeat till the surface of the oil is filled up with fritters. Deep fry till the dal fritters turns light golden brown in color. Carefully remove the dal fritters onto a absorbent paper. Repeat the same with any remaining dals mixture. 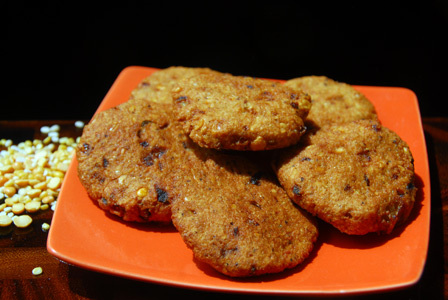 Serve dal fritters as a snack. Notes: Make sure dals are soaked well. Suggestions: If the inside of the bonda is not cooked properly, put them back in medium hot oil and fry till done. Make sure the consistency of the ground dal mixture is not too loose. Variations: Check other deep fried recipes here. Other Names: Dal Fritters, Pappula Punukulu. A mixture of dals (chana dal, toor dal, urad dal) is roasted on low flame in heavy bottomed pan and powdered. 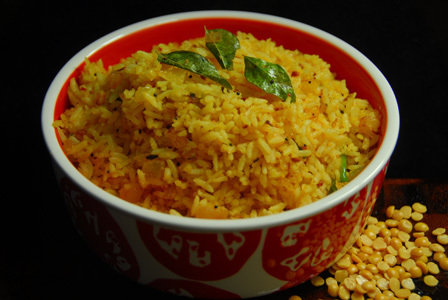 Steamed rice is mixed with the freshly roasted and powdered dal mixture for a quick recipe. Serve powdered dal rice with tomato raita or with any raita of your choice. Makes: around 2 Servings of Powdered Dal Rice. Wash rice with fresh water and cook in 2 cups of water till all the water has been absorbed and rice turns soft and fluffy. Roast toor dal, chana dal and urad dal in a pan on low heat until they turn golden brown in color. Remove from heat, cool to room temperature and grind into fine powder using a spice blender. Heat oil in the wide pan, add all talimpu ingredients in order. When cumin seeds change color, add chopped onion. Fry till onion turns brown around the edges. Add sliced green chiles and grate the garlic into the pan. Fry till raw smell of garlic is gone or until few seconds. Stir in ground dal powder, red chili powder, turmeric powder and salt. Immediately stir in steamed rice and carefully mix all the ingredients. Remove from heat and keep covered for couple of minutes. Uncover and serve powdered dal rice with tomato raita or with any raita of your choice. Notes: Make sure rice is cooked right and the spices are not over roasted. Suggestions: Adjust green chiles for spice. If rice is not cooked well, add few splashes of water after adding it to the pan and cook covered on low flame. Roast a big batch and keep a jar of freshly roasted dal powder and use it as required. Variations: You can also add a tbsp of lemon juice if desired. Other Names: Pappula Annam, Powdered Dal Rice. Roti batter is prepared with idly rawa and urad dal. The batter is then fermented and made into thick roti. The roti is layered with freshly prepared spicy sesame powder and the rotti is cooked till done. 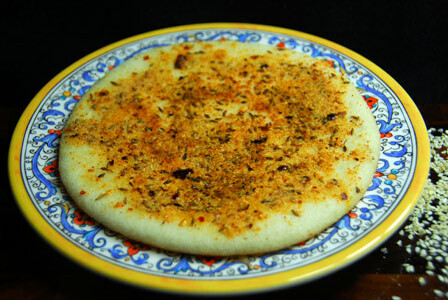 Serve rotti with spicy sesame powder as a breakfast. Makes: around 5 Servings of Rotti with Spicy Sesame Powder. Toast the sesame seeds on low heat till they change color. Add red chile and remove from heat. Grind toasted sesame seeds, red chile, red chile powder and salt into coarse powder. Heat a flat pan on medium heat, pour a big ladle full of batter on the pan. Spread the batter into thick roti. Layer the roti with cumin seeds, a tbsp or two of ground sesame powder. Uncover, pour a tbsp of oil and turn over the roti. Cook the roti for another minute or two on a medium flame. Serve rotti with spicy sesame powder immediately accompanied with a glass of buttermilk if desired. Notes: Make sure to cook the roti well. Suggestions: If rotti is not cooked properly, put it back on heat and cook covered on low heat till done. Variations: You can check other similar recipes here. Other Names: Rotti with Spicy Sesame Powder, Minapa Rotti.